Dye Sensitized Solar Cells, also known as Grätzel cells, are very promising owing to their potential efficiency as well as being cheap. However, further improvements are necessary, particularly on the photocathode side. This requires a more detailed understanding of the molecular and electronic dynamics. To this purpose we have undertaken a study of the photophysics and the primary processes occurring after light absorption using femtosecond luminescence up-conversion (project funded by the CEA programme DSM Energy). A PhD student, Valentin Maffeis, co-directed by Drs. Thomas Gustavsson and Bruno Jousselme (DRF/IRAMIS/NIMBE/LICSEN) is working on this subject (2015-2018). R. Brisse, et al., A red to blue series of push-pull dyes for NiO based p-DSSCs, Sustain. Energ. Fuels, 2 (2018) 648-654. Figure 1. Time-resolved fluorescence spectra of a new push-pull type molecule I solution. The excited charge transfer state formed by light absorption is strongly stabilized by the polar environment. The charge separation (and ultimately, the charge injection) occurring in the excited state is in dynamic competition with the energy stabilization which leads towards a non-radiative internal conversion (leading to electron back transfer). 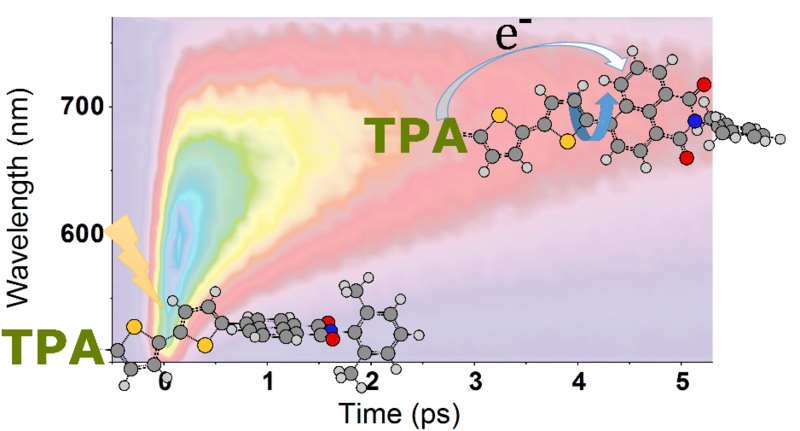 It is therefore important to characterize the different processes involved in order to optimize the "wanted" reaction paths (charge separation) with regards to the "unwanted" reaction paths (internal conversion).